Stanley Donen, a highly-successful director of musical comedies and rom-coms who quite admired the films of Alfred Hitchcock, decided he wanted to create an homage to the Master of Suspense in the form of a film in the Hitchcock style. The result was Charade, hailed by critics as the greatest Hitchcock film that Hitchcock never made. 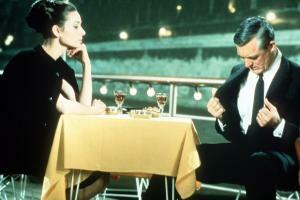 Charade is also a taut romantic thriller enlivened by exquisite sets and mesmerizing performances from Audrey Hepburn and Cary Grant as the young widow in jeopardy and her love interest who may or may not be what he seems, respectively. It is rare these days for Hollywood to create a film that revels in sophistication and takes for granted that its audience has more than two brain cells to rub together. This is where Charade shines; the audience is not pandered to or hit over the head every 30 seconds with the salient plot details up to that point. Relevant facts are never hidden, but neither are they paraded in such a way that a five-year-old has the storyline sussed inside of five minutes. Instead, Donen and screenwriter Peter Stone craft three-dimensional characters whose actions not only seem plausible but help propel the film, keeping the audience guessing until the very end. To reveal much about the plot would be to ruin some of the magic of this film; it's far more fun to take Hepburn's character's journey with her, as she tries to figure out whom to trust while endeavoring to solve the puzzle of her deceased husband's life - and death - and prevent his former partners from ending her existence as well, all while falling in love with likely the worst man possible. An interesting side note here: Cary Grant felt it unseemly for a man of his age to court a woman so many years his junior, thinking the audience would not only never approve of such a thing, they'd never believe the young lady would accept such attentions, so the script was rewritten to make Audrey Hepburn's character the pursuer. Would that some of today's leading men would be so thoughtful (Harrison Ford, Michael Douglas and, especially, Woody Allen, I'm looking in your direction).